About a month and a half ago, I ended up in the E.R. with some excruciating pain in my lower right abdomen and back. I’d had the pain for a day and a half before going to the local hospital. You see, I had convinced myself that it was just food poisoning, especially since the pain was radiating to my back. I thought there was no way that it really was an appendix issue. I only went to the hospital because the pain was so severe that I could not sleep the night before. It didn’t take long for them to give me the bad news that I needed to have emergency surgery and a required overnight stay in the hospital. Fortunately, I do have health insurance. And as the bills keep rolling in, I am feeling extra fortunate because there is no way that I would be able to afford to pay them without insurance. Just How Much Is A Laparoscopic Appendectomy In The US? While I was waiting to get prepped for surgery, I was looking up the cost of the procedure on my phone. What I discovered is that the price varies greatly from one area of the U.S. to another. In fact, it can even vary by hospital in the same city! My hospital visit took place in Raleigh, NC and you might be shocked at the total cost of this procedure. Yeah, that’s a LOT for being in the hospital for such a brief period. I’ve been fortunate in that this is really the first time that I’ve ever had to be in the hospital, so I was clueless about how my insurance deductible would work and if my Obamacare health insurance plan would leave me owning more than my deductible. You see, I’ve read stories about people who went into the hospital that was approved by their insurance, but that one of the doctors was not and they ended up owing thousands for the doctor while the hospital was covered by insurance. So far, everything seems to be covered by my health insurance plan. The bill in the image above is just a statement. Each provider is sending individual bills to me, with the amount due after my insurance. I have to pay until my deductible is satisfied. My health insurance is also sending me an EOB statement each time they process a claim so that I will know what they paid and what I am left owing. It also shows me how much of my deductible has been met and how much is still outstanding. If I did not have health insurance, then I suspect these bills would’ve given me lots of stress and worry. Now, I only have to worry about meeting my deductible, which is still not a great scenario in terms of trying to pay down debt and having to deal with new debt. But still, it could be a lot worse without insurance, and for that I am thankful. My appendix was removed in 1964. My surgeon cost $250, my anesthesiologist was less than that and I spent 3 days in hospital. The total came to less than $600 which is why I found your costs so absolutely shocking. Preposterous! My wife just had it done. We have no insurance and with a $189,000 bill, we are looking our house, and cars. If it wasn’t for my father, we would be homeless. That’s American health care for ya. Go from upper middle class to homeless in one day, due to an unpreventable disease….. Thanks Shawna for the information. I just went thru the same thing. I also have insurance but with a $10,000 deductible. I hope to be able to work with the billing dept at the hospital to get a reduced charge. a $10,000 deductible is terrible. Obamacare and it’s astronomical deductibles. Never heard of such a thing. Got that beat…Overnight in hospital in Webster Texas for same procedure $51K. Not including doctor bills. Thank you for trusting us wi1h your l ealthcare needs. We hope our core exceeded your expectations. Please contact us if we con be of fur·ther assistance. Get a new health plan that fits your needs and budget at getcave[edhca com Visiting discloses to Enroll AmeriCO-‘you nave been a patient of this hospital. 2016 through December 9, 2016. *The amount you owe may include copay, deductibles or non-covered charges. I*AMOUNT YOU OWE	$ 1,224.35 ! 11′ Pay-by-phone or call Customer Service at:	• 866-453-5898 Available Mon-Fri 8AM – 5PM CT	l!J.	.
Mail in a check or credit card information with the section below. Disponible asistencia para el idioma espanol. O Check here if your address or insurance information has changed. Please indicate changes on the back of this page. Make checks payable to: CHCA CLEAR LAKE LP. Will forward actual bills for proof. Just saw my bills from my Christmas Day appendectomy. Just shy of $84,000. Good thing you had a decent deductible. That is one of the benefits of having the mandated insurance, something that most people wont fathom until something like that happens to them or someone close to them. I knew someone similar, his bill came in at $32,000 had to stay an extra night in the hospital to play it safe. Had to pay 7,500 himself, but the for-profit hospital offered a several payment plan interest free if he didn’t miss more than two payments. Some hospitals (particularly for-profit) have appeal programs, where if you are in a crisis situation (between jobs, raising 4 kids,etc) you can appeal. I 70% of verified truthful appeals got their quotes cut in half, some even written off. My brother had his appendix removed in December in GA. Was in ER and out of surgery headed home in under 9 hours total…no overnight stay. Just the hospital bill (which was just received last week) was 65,742.90. This doesn’t include any ER physician, anesthesiologist, radiologist, or surgeon’s fees; those were all separate. Will definitely be contesting this bill as some of the charges seem fraudulent as far as OR and recovery times. 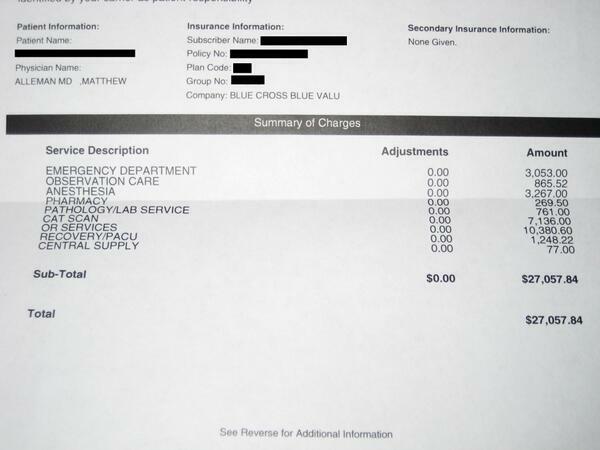 My wife had an appendicectomy in Virginia in 2015, the doctor charged the insurance $1850.00 for the surgery, but the insurance only paid him around $650 (according to some regulations). The doctor sent me a warrant for the difference. There is any law in Virginia creating a tariff for an emergency – appendicectomy services? Thanks! This is unbelievable. Apparently, I had peritonitis. They said I was fine on Monday night when I went to ER (appendix had not burst). They made me wait until Tuesday midday for the surgery. At the end of the surgery, doctor said it had burst. Anyway… wanted to share my story. I have no words for this. Thank God I had insurance. How on earth did thst happen.????? I had emergency appendectomy last Monday and haven’t got the bill yet and I have no insurance. I’m terrified of what this is going to cost me. I got a Bill of 51 K without ER. My insurance would cover only 10K. what are my options here? Thank You so very much. ‘Was trying to figure up an amount to bank in case of an emergency and appendectomy was a “guess what you might need” category. Including the image of the bill made it feel more genuine. Thus, upped my trust of your comments. ‘Have elected to forgo insurance at this time and am wanting a goal financial number to reach toward.